NIA – The Nevis Health Promotion Unit (HPU) in the Ministry of Health, in collaboration with the Community Health Nursing Services, is commemorating World Hypertension Day (WHD) on May 17, with visits to local businesses on the island and offering their employees free blood pressure, blood glucose and body mass index checks. The observation of WHD is being celebrated this year under the theme “Know your numbers” to increase high blood pressure awareness. As such, the HPU visited the St. Christopher and Nevis Social Security Board office in Nevis where members of the HPU met with employees. 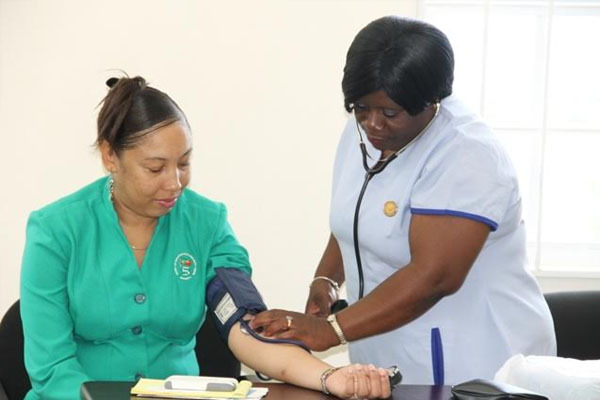 The activity, included an educational session facilitated by Dietician at the Alexandra Hospital in Nevis Vernice Blackett, who also performed body mass index checks while Nurses Elvina Mulcaire and Jean Tyson conducted blood pressure, and blood glucose checks. Consultation was also conducted by Health Education Officer at the HPU Nurse Eldina Farrell. The participants pledged to continue eating healthy. Senior Officer at the Health Promotion Unit Nadine Carty-Caines, was also present at the event and explained that the activity is being hosted in an effort to facilitate the local business employers and employees who are unable to participate in the regular screenings offered at the Charlestown Square. “The health of our people determines the wealth of our nations therefore we have to ensure that people are healthy and advise them, we need to educate them and we need to motivate them to take stock of their own health,” she said. Caines, also urged the public to know your hypertensive, blood glucose, body max index and cholesterol numbers as they are a good indicator of an individual’s health status. She also stated that the HPU will be visiting the Customs Department at Long Point on Wednesday May 18 and the Nevis Electricity Company Ltd. (NEVLEC) on Friday May 20. Caines also took the opportunity to encourage local businesses to maximize on the opportunity to have free health screening done in the comfort of their office. Business places who would like to take advantage of the offer can contact the Unit at 469-8010 or 469-5521 extensions 2037 or 2064.